John and his brother, Anthony, came to America in 1635 on the James. He settled at Newbury, where he worked as a carpenter and an innkeeper. John was married twice. His first marriage was to Alice Grantham of West Dean, Wiltshire, England. There is no record of Alice in New England. In Newbury, on October 29, 1647, John married for a second time. His second wife was Mary (Shatswell) Webster, widow of John Webster. Mary had three siblings who had immigrated to Ipswich, Massachusetts - brothers John and Theophilus Shatswell and sister, Margaret (Shatswell) Curwen, wife of Matthias Curwen. Despite the fact that he sometimes got in trouble (often for standing up for his beliefs), he also contributed his service to the local officials in a number of different offices. He was a member of quite a few petit juries and grand juries over the years. He was the Newbury constable in 1655 and clerk of the market in 1656. His independent streak is well documented through the court system. His first recorded brush with the law makes one question whether his first wife was still alive since he seems to have gotten a little fresh with a married woman. The part at the end makes me wonder if she was a willing participant in the interaction. On September 29, 1646, "John Emery, for miscarriage with the wife of Henry Travers, fined £3 or to be whipped, and pay witness fee to Christopher Bartlett. Bound to good behavior and not to frequent the company of the wife of Henry Travers. In 1654, John joined with other town leaders to sue John Merrill for selling the town's lands without order. Also in 1654, there was a controversy regarding a petition in support of Lt. Robert Pike of Salisbury. That is a story for another blog post. All of his dealings on behalf of his step-children will also be told later. In 1658, John, his son John Jr., his step-son John Webster, and Solomon Keyes were admonished by the court for disturbing the peace and acting disrespectully. They were told to "beware of the like sinful practices for time to come, which this Court will not bear; and that they pay the several charges of their neighbors the last Court & this, in coming for relief from such under courses." On May 5, 1663, John Emery appeared before the court for entertaining Quakers. In another church controversy in 1669, John Emery was one of those opposing Rev. Mr. Parker. He appears on a 1671 list of Newbury church members presented as part of this discontent. In 1678, John submitted a bill to the local militia for "a new saddle & bridle" 28s. ; a "sword & belt," 12s; 2 pounds powder & bullets," 4s. ; and "saddle & cloth," 23s. 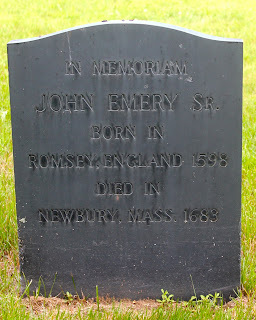 John died on November 3, 1683 and was buried in the First Burying Ground in Newbury. John Emery - lists his children and some testimony about his entertaining Quakers. Connections to the TV show Downton Abbey - Maps the areas in England where the family lived near the town of Downton.